Based on a highly succesful Dutch concept “Patat Frit”, Chip ‘n Dip was born in 1995 in Cape Town. The concept is simplicity in its self, with fried potato chips covered in delicious sauces, served in a unique cone shaped container. 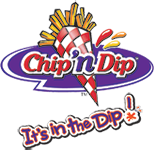 Chip ‘n Dip originally started out as a mobile vending concept and grew to stores, both stand alone and Co-Branded outlets. Today we boast a range of different products that can be added to your Chip ‘n Dip, or sold on their own. The essence of the Chip ‘n Dip concept is the simplicity of the operation, and the universal appeal of the product, not to mention a great return on your investement. CHIP ‘N DIP - IT IS SIMPLY TOO GOOD TO RESIST!